Corrugated Stainless Steel Tubing (CSST) flexible, stainless steel pipe. This CSST pipe is used in residential and commercial installations. The CSST pipe is a coated yellow color but most important the coating is fire proof and will not burn. This CSST pipe is mostly used for installations through roofs, basements and places of concern. 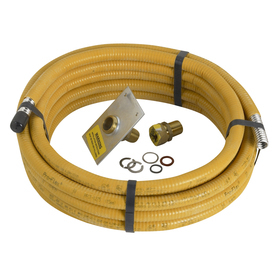 This bendable stainless steel pipe is coated in a bright yellow color. The gas industry in South Africa knows and identifies this pipe as a gas vapor pipe. The coating on this pipe is designed in such a way that it is completely fire proof and will not light up when there is fire around it.